The BPE Weekly Update is a selection of news, featured videos, events and offers that we think may be of interest to the 6000 members of Baltimore Professionals and Entrepreneurs. Not yet a member? Become a member by clicking here. Want us to feature your event or special offer? Contact us. Special thanks to the Department of Commerce Minority Business Development Agency for inviting Will Holmes to speak! 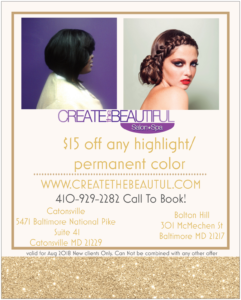 Contact Ericka Cherrie at Create the Beautiful salons for discounts on highlight and permanent color. Contact Ericka Cherrie at Create The Beautiful salons for discounts on shampoo and style. Contact Ericka Cherrie at Create the Beautiful salons for discounts on services. Are you ready to buy or sell your home or investment property? 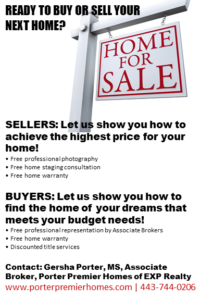 Contact Gersha Porter of Porter Premier Homes!